Just about every business finds itself tasked with some form of routine, repetitive data work. 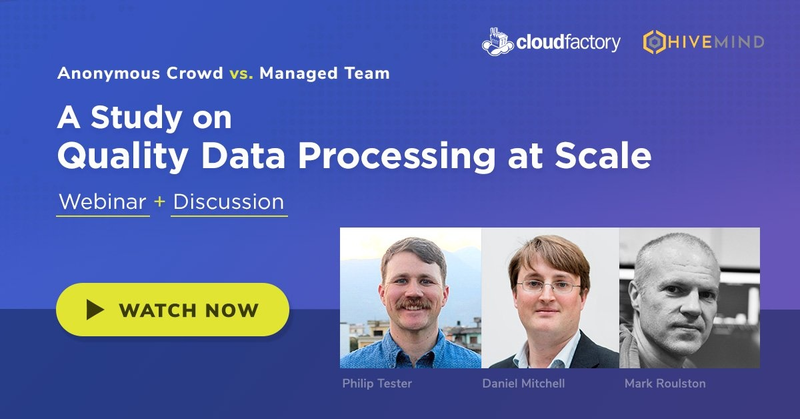 As the amount of unstructured data rises exponentially, so does the need to manage and process that data in a way that creates value for businesses and customers alike. The size and complexity of these processes certainly varies. It might be as simple as transcribing audio from videos or as complex as processing thousands of daily inputs in near real-time. Regardless of the importance or complexity, this work simply needs to get done. One question remains...is this a DIY (Do it Yourself) or a DIFM (Do it For Me) process? Author John Naisbitt first penned this well known quote back in 1982 in his book Megatrends. It was certainly prescient at the time, but it was probably hard to imagine that we’d live in a world where the amount of data created doubles every 18 months. What’s even crazier is that the vast majority of that data is useless in terms of making it meaningful or actionable. The rise of unstructured data is being driven by the relatively new digital forces of social, mobile, analytics and cloud often referred to as SMAC in the IT world. With 80% of that data being unstructured, it presents rising challenges and new business opportunities. When tasked with the challenge of managing, categorizing and otherwise deriving value from all of this unstructured data, many organizations first try the DIY (Do It Yourself) approach. It’s an attractive option, with the tools available surely this should work. You can hire a team of freelancers or interns, or you can leverage a platform like Amazon Mechanical Turk. The problem that businesses run into again and again is that it becomes unscalable. Finding workers, training them and then retaining them becomes a headache quickly. Costs skyrocket and employee churn takes on a whole new form. Some try independent contractors, but this carries the same challenges, just packaged differently. How do you manage a growing workforce that is geographically dispersed and completely disconnected? Ultimately the DIY approach might work well for one-time projects that require a human touch, but for ongoing processes that need to scale, you might find the DIFM approach works much better. As it happens, some of the most innovative technologies today use the DIFM approach to power their offerings and scale fast. Think businesses like Uber, Expensify, Amazon and Zenefits. These companies and many others are leveraging the power of on-demand workforces to get important work done. In an ideal world all of this routine, repetitive work would be automated, freeing up valuable resources to focus on innovation and growth, but the truth is that human intelligence is still required to get quality results. Whether it’s extracting information from scanned documents, images, audio, video, or the web this work simply needs to get done. The bottom line is that many successful businesses today are making the deliberate choice to take this challenging and tedious work off of their plates. This enables them to focus their attention on where it should be, on innovation and improving their customer experience. They know that success is achieved by focusing on what matters most, not on creating new burdensome processes that divert focus and resources to something that simply isn’t a core competency. When considering a DIFM solution, there are several factors you’ll want to keep in mind. Of course, you’ll want a cost effective solution. But beyond cost, fast growing companies need a partner that can provide quality results with agility. Business rules change and customer needs evolve, therefore you’ll need someone who understands that reality and has the capability to meet those needs quickly and efficiently. Perhaps the most important factor is scalability. The capability to leverage both cutting-edge technology and provide the manpower needed to help you grow is essential. 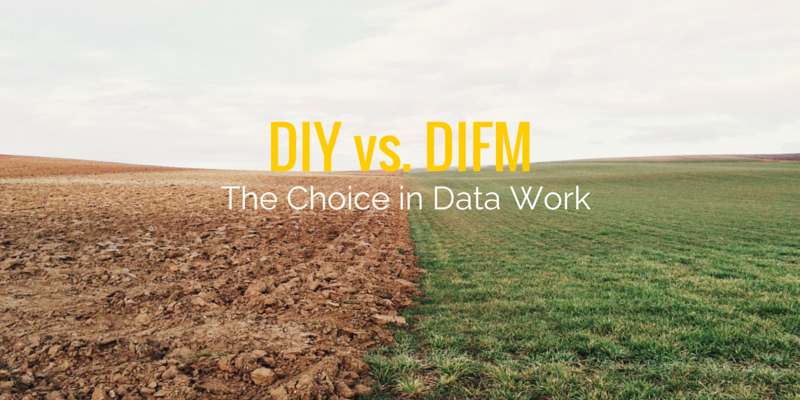 Scalability is also the biggest challenge with the DIY approach to getting data work done. Building a workforce internally or externally is challenging and costly, too often scaling that workforce simply becomes impossible. It’s easy to think short-term, but business growth is a marathon not a sprint, so choosing a solution and partner that you know can scale and grow alongside you will assure you have the competitive edge for a long time to come.